Hong Kong’s illegal wildlife trade is contributing to a global extinction crisis. Asia’s World City has unfortunately become a hub for illegal wildlife crime. While every year millions of animals and plants are illegally trafficked through Hong Kong, there is rarely investigation beyond the carriers, or mules, into the smuggling syndicates behind the criminal activity. 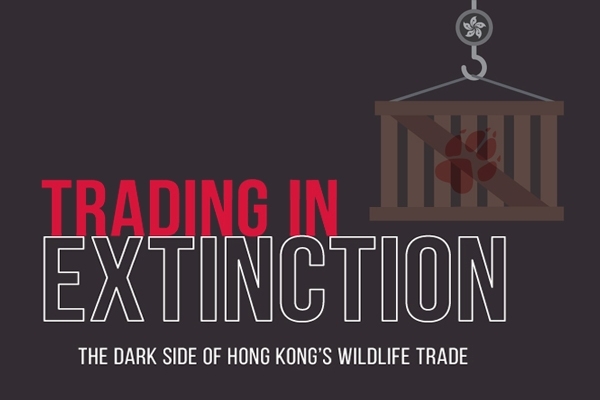 A new Hong Kong Wildlife Trade Working Group report, “Trading in Extinction: The Dark Side of Hong Kong’s Wildlife Trade” urges the government to enhance its current enforcement strategy against wildlife smuggling. The report illustrates that over the past decade, the diversity of endangered species imported into Hong Kong has increased by 57%. At the same time the value of the estimated trade has increased by 1,600%. Since 2013, seizures of illegal ivory, pangolin scales and rhino horn have been made by Hong Kong authorities, potentially equating to the deaths of 3,000 elephants, 65,000 pangolins and 51 rhinoceros, according to the report. Following on from “Wildlife Crime: Is Hong Kong doing Enough?“, the new report details the current nature of illicit wildlife trafficking, providing clear insight into Hong Kong’s role as a major trading hub. It seeks to highlight Hong Kong’s role in the pressing global extinction crisis. The report focuses on the type and volume of seizures over the last 5 years and documents these in the 200-page report, which also identifies clearly, how future policy and enforcement could be improved to provide the urgently required long-term sustainability. Further, the report examines the high volumes and values of products being trafficked into and through Hong Kong, whilst also investigating organised criminal links and consistently used methods of smuggling. A newly created ADMCF WiPS database holds the gathered seizure data from various sources. Additionally, legal records and individual cases have been examined to show that the seriousness of the crime is not matched by sufficient penalties or deterrent legislation. Trading in Extinction considers the current circumstances in Hong Kong, and subsequently makes recommendations for increased penalties, investigative capacity and enforcement in relation to wildlife crime. In particular, the report makes the case for wildlife crime, as serious, transnational and organised, to be considered under the Organised and Serious Crime Ordinance, Cap 455. “Wildlife crime in Hong Kong remains under-policed and under-investigated. Wildlife smuggling is not regarded as organised and serious crime, under Hong Kong law,” said Associate Professor Amanda Whitfort of the Hong Kong University Faculty of Law and an author of the report. “Failure to include wildlife smuggling as a crime under Cap 455 hampers authorities’ powers to effectively prosecute those behind the networks and syndicates that take advantage of Hong Kong’s position as a major trading port,” she said. Hong Kong, although small, could play an outsized role with proper regulation and enforcement relative to the wildlife trade.